Buena Vista Heritage took over operation of the Buena Vista Model Railroad in 2004. The exhibit, on the second floor of the Buena Vista Heritage Museum, is always on display during museum hours, but not always manned. Call the Museum at 719-395-8458 for operating times. 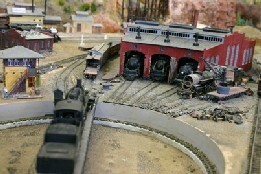 The Buena Vista Model Railroad Society was founded in February, 1984, to promote model railroading and interest in the historical background of railroads and mining in the Upper Arkansas Valley about 1900. The Society decided to plan, construct and operate a model railroad patterned in general after the three lines that ran through Buena Vista. These were the "Denver, South Park and Pacific Railroad," "Denver, and Rio Grande Railroad" and "Colorado Midland Railroad." The Society layout is in the vintage1882 Chaffee County Courthouse. This building is of great historical value to the Upper Arkansas Valley area and also houses the Buena Vista Heritage Museum. The Society has constructed a large model system with substantial regional and historical content. 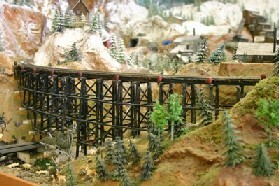 It is built in HO scale (1:87), and continuous loop operation. The prototype area is 130 miles from the Royal Gorge to Tennessee Pass. For the purpose of the model, this area has been selectively condensed with much artistic license. The model attempts to represent the three railroads as they appeared during the period from 1900 to 1920 although trains of more recent design are often run. The Denver, South Park and Pacific was a narrow gauge railroad which originated in Denver. It came into our area over Trout Creek Pass to Schwanders (the site is located southeast of the Arkansas River bridge on US 24-285). The line arrived in Buena Vista on March 3, 1880. The depot was located where Avery-Parsons Elementary School is now. The mainline continued south from Schwanders to Nathrop and turned west up Chalk Creek to St. Elmo, Hancock and the famous Alpine Tunnel. The railroad was known variously as the Denver, South Park and Pacific, The Denver and South Park, the Denver, Leadville and Gunnison, the South Park Division of the Colorado and Southern, and simply as the South Park. Alpine Tunnel may be reached by taking US 285 to Nathrop, turn west on Colorado 162. Take the paved road for nine miles, then a good gravel road for six and one-half miles to a wye junction just before reaching St. Elmo. Turn left on County Road 295, and follow this road five and one-half miles to the ghost town of Hancock. Park at the junction of two four-wheel drive roads. Hike or bike up the old grade towards the Alpine Tunnel and Williams Pass. After one-quarter mile, the Williams Pass four-wheel-drive road turns left. Continue straight on the main grade for three and one-half miles to the east portal of Alpine Tunnel. To the left and above the tunnel is a trail ascending about 400 feet to Altman Pass. From here you can descend to the west portal and visit the railroad relics there. You can also drive to the West Portal from Pitkin off US 50. The Denver and Rio Grande, another narrow gauge railroad reached Buena Vista on June 9, 1880, after a lengthy fight, both with guns and in court, with the Santa Fe Railroad over the Royal Gorge route. This route is from Pueblo, through the Royal Gorge, to Salida, Buena Vista, Leadville, over Tennessee Pass to the mainline at Dotsero. The railroad was made into a three-rail system in 1888 and into standard gauge only in the early 1920's. The Denver and Rio Grande merged with the Rio Grande Western to become the Denver and Rio Grande Western. Later it merged again, and ended up part of Union Pacific. U.P. closed the line in 1997. It was the only railroad still coming through Buena Vista, although there was no service provided to the town. The Colorado Midland started from Colorado Springs and was the first standard gauge over the Continental Divide. The Midland went west to Woodland Park, sent a spur to Cripple Creek and Victor, and continued over Ute Pass to Lake George. From there it followed the South Platte River across South Park. It also entered the Arkansas Valley over Trout Creek Pass, where it used an overpass to go over the tracks of the Denver, South Park and Pacific Rail Road. The Midland arrived in the Buena Vista area in 1887. The Midland depot was located high above the town on the east side of the Arkansas River on Midland Hill, at the east end of Main Street. Passengers were taken from the ticket office in town to the station by the station 'hack' - a horse-drawn wagon. Access to this grade can be reached by automobile from the Scenic Overlook sign at the foot of Trout Creek Pass on US 24-285, about one and one-half miles east of Johnson's Village. After turning off the highway, take the first right hand road to the railroad grade. Turn left and this will take you on the grade above Buena Vista to the site of the old depot and to the point where a high steel trestle was located. This roadway is maintained by Chaffee County, and there is room to turn around at this point. Hikers and mountain bikers can reach the Midland Grade from downtown Buena Vista. East Main Street runs into the River Park parking lot. Cross the Arkansas on the foot bridge and hike or bike up the the Barbara Whipple Trail. Please keep dogs on leash and clean up after them because this is the most popular hike in Buena Vista. The four tunnels north of Wildhorse can be reached from downtown Buena Vista by taking Colorado Avenue north about two miles. You can return to Buena Vista or continue about five miles north on County Road 371 to Otero Pump Station, where you can pick up US 24. 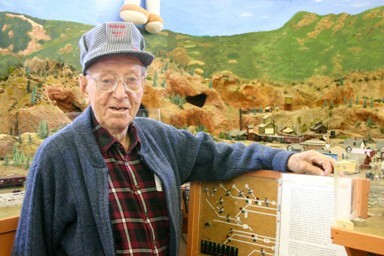 In this one-hour DVD, long-time model railroader Art Williams tells the history of the Upper Arkansas Valley using the Buena Vista Model Railroad layout to illustrate. Tour the Arkansas Valley, from 1900s Leadville through Buena Vista, to the Royal Gorge. Learn about the three competing railroads, and the mines, towns, and industries they served. This recording is on a DVD-R disk. BVH understands that some DVD players cannot read this format. We will refund your purchase if it is returned to us undamaged. Total if shipped in Colorado: $19.50. Make checks payable to: Buena Vista Heritage. You may also call Buena Vista Heritage at (719) 395-8458 to for more information or to arrange to purchase the DVD in person.